This morning I got out on a walk to the row of pecan trees I have been photographing for the past three winters. Not exactly a morning constitutional, yet. It’s about a mile and a half from the bunk house to this stretch of pecans. I was passed by about four vehicles on the way to the trees; these were tractors, semi-tractor trailers, and maybe a passenger car. The first pickup truck to stop to check on me was driven by my father and law who asked if I wanted a ride. I got a sense that no one walks in Dexter, NM. I photographed all fifteen of the original pecans. There are several rows of younger trees. I am interested in the original row because these were older trees that were pruned back and moved from another location. They are strange looking, almost Seussian in appearance and the first thing I truly recognize when Bridgette and I pull into her home town. 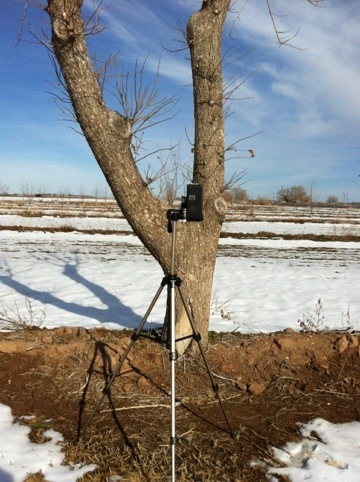 The photograph below shows the Holga 120WPC photographing the third pecan tree to the south. 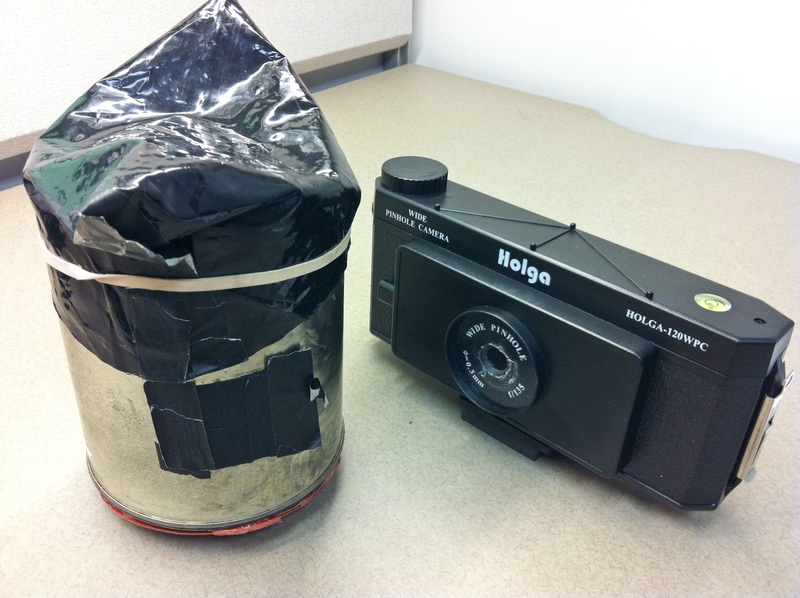 I’ll be back out there with more film on Saturday and Sunday to photograph the rest in pinhole fashion. 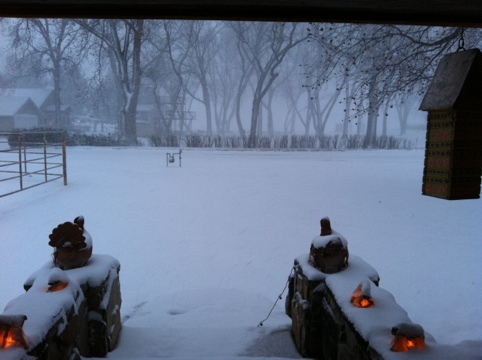 I’m currently visiting family with Bridgette in Dexter, N.M. This part of the country got over a foot of snow in time for Christmas. I’ve brought the pinhole cameras to photograph the pecan and cottonwood trees but I’ve been slowed down by a stiff lower back and lack of cold weather clothing i.e. gloves. The images and posts will mostly be from an iPhone and ate meant to be visual notes without a specific future project in mind. Here’s example photographed earlier today. 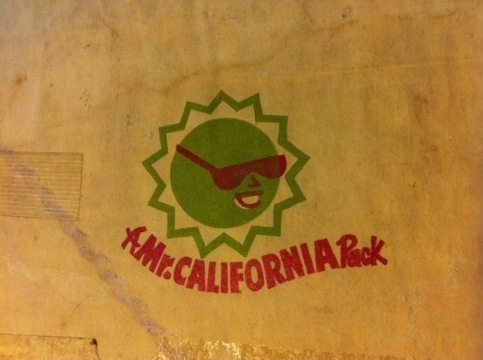 This a detail of a logo from a vintage box used to ship California oranges and repurposed to contain a present for Bridgette’s parents. 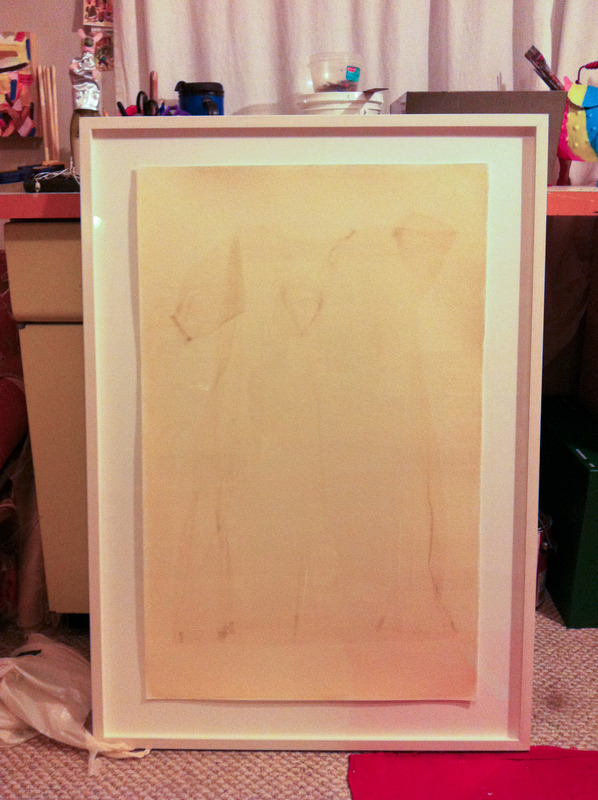 Here is the cut grass sleeping dress anthotype, made during the summer in Boston and framed for the Roy G Biv ImageOhio 12 next month in Columbus. Early this year I thought I had reached a point…a point of no more making presents (at least gifting photographs I have made). Our trip back to San Diego two years ago netted a beautiful shot glass with metric measurements on it (useful in alternative processes) and a plastic bag from the butcher section of Keils grocery store. 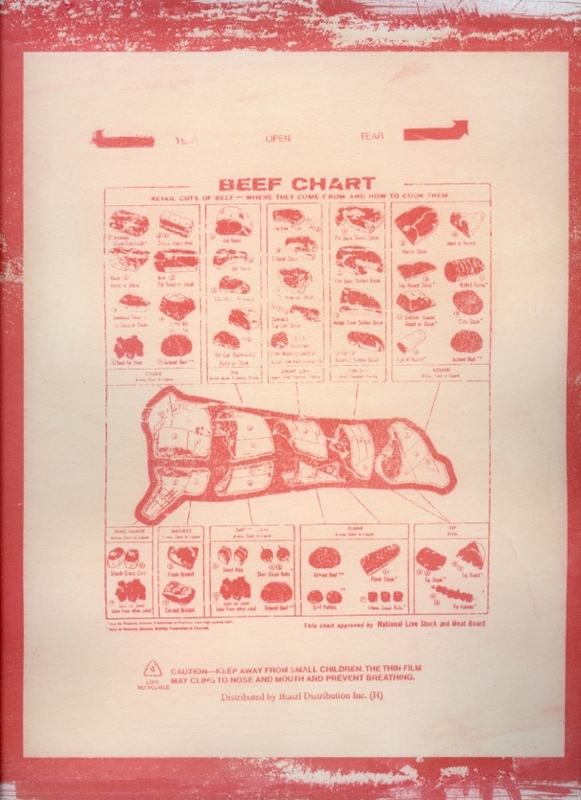 The plastic bag has a chart depicting the cuts of beef and where they come from on the steer (or is it a cow?). My in-laws are New Mexico ranchers and Bridgette knew this would someday rightfully take its place as a Christmas present. This year it has. Printed in the gum bichromate process in flame red and carmine red gouache for pigment (on Fabriano Artistico Extra White Hot Press). The PVA size I used didn’t prevent staining so the highlights took on a bit of a pink color. But as Bridgette remarked, it is very much the color of meat. Just a quick image of what I have been working with. Scanned negatives to follow. 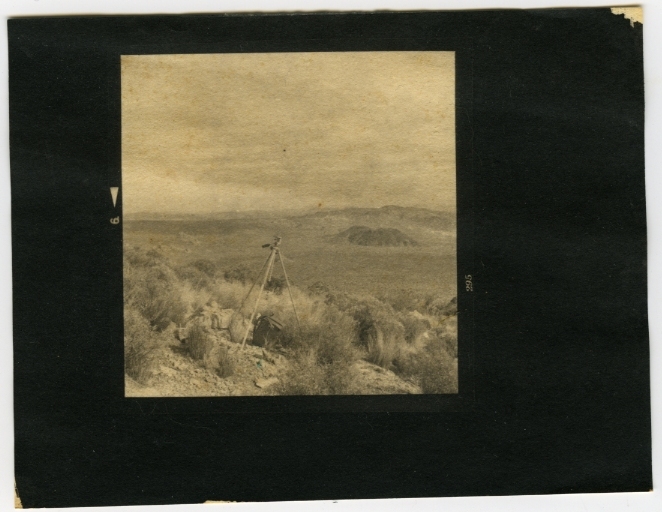 I have work in an exhibition of alternative processes organized by the Kiernan gallery and juried by Christopher James. The exhibition is scheduled to run from January 10th – February 4th. There is also an online version of the exhibit you can see at http://kiernangallery.com/3/Image.asp?ImageID=1402035&full=1&apid=1&gpid=1&ipid=1&AKey=8JMSW35S. The exhibit consists of work from Tyler Suppha-Atthasitt, K.K. DePaul, Diana Bloomfield, Ronald Cowie, Emma Powell, Sarah Nesbitt, Susan de Witt, Scott Barnes, Edie Fogel, Michelle Rogers Pritzil, Liz Lee, Geoffrey Agrons, Ivan Bernal Palli, Aspen Hochhalter, Dominic Turner, Rheana Gardner, Peter M. Lindstrom, Andréa Brächer, S. Gayle Stevens, Lindsey Beal, Jenny Brown, Robert Alexander Williams, Timothy McCoy, Paul-Jude Guillaume, Jessica Somers, Michele Cole, Kaltes Klares Wasser, Jasmine Swope, Paul Karabinis, Dan Herrera, Karen Divine, Ryan Shelley & Elizabeth Herrmann, Molly Rapp, Clive Heritage-Tilley, Kristen Kay Thoen, Iciar Bravo, Marydorsey Wanless, John Shuptrine, Sally Ayre, Missa Coffman, K.K. DePaul, Patrick McNelis, Erin McGuire, Kate Shelley, Genevieve Neal, Genevieve Neal, Annie Hogan, Ig Mata, Donna Moore as well as University of Dayton alumnus Christine Zuercher (a former student of mine).